We offer a range of rigorous academic courses, quality teaching and extra-curricular activities. 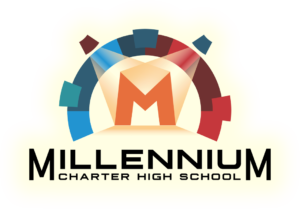 Millennium Charter High School prepares creative thinkers for success in life, using instruction in Arts, Media & Entertainment. Millennium Charter High School is a community, not an institution. It’s small enough to be close and caring and big enough to provide opportunities unlike any other high school in Monterey County. At our State of the Art Facilities at the Monterey County Office of Education (MCOE) and Sherwood Park, curriculum and instruction are based on hands-on learning in the arts and technology. We have all the classes students need to be prepared for college as well as for careers in Arts, Media, and Entertainment. At the MCOE site, students have access to a Digital Media Lab featuring laptop computers and state of the art editing software, a black box theater, a high-definition television studio with professional control rooms, and a radio station designed for broadcast as well as podcast production. MCHS is an independent, direct-funded public charter school with two locations in Salinas, California: at the Monterey County Office of Education (MCOE) and the Sherwood campus at 940 N. Main St. MCHS’s curriculum and instruction are based on hands-on learning in the arts and technology, integrated into content areas. Students from throughout Monterey County receive college preparatory education in which the Common Core standards, Visual and Performing Arts standards, and Digital Media Arts standards are delivered through the lens of four School-wide Learner Outcomes (SLOs): Creativity, Self-awareness, Empathy, and Critical Thinking. MCHS’s program fosters an academic environment in which students see the relevance and importance of their education. The school’s focus on Digital Media Arts is unique to the area. MCHS is currently both the smallest public high school and the only site-based charter high school in the county. Guided by research in creativity, innovation, and cutting edge instructional practices, MCHS will provide core academics and professional skill development with a focus on the performing arts and digital media technology. Our students will help build a safe, responsive community in which they will learn to cooperate, collaborate, and communicate in order to reach their highest potential and become socially responsible citizens of the 21st Century. Millennium Charter High School graduates will be prepared for College and ready for employment in the evolving world of Media Arts Technology through a balance of traditional academics and real-world, hands-on experiences. Students will discover their unique gifts and talents and how to use them as they work individually and collaboratively. Engaged and educated in a true community of learners, students will be empowered to realize their dreams.